Providing general and cosmetic dentistry for the entire family! Our philosophy is to spend individualized time with each person that walks through our doors requiring the services of a great Thousand Oaks dentist. We believe that listening to our patients and addressing their needs within the context of excellent care is the greatest way that we can serve our patients. Our emphasis on patient comfort is unmatched. From our peaceful lobby to our friendly staff, our office puts you at ease from the moment you walk in the door. We are committed to providing individualized care to each of our patients in the most comfortable setting possible. We accept insurance for employees of Amgen, Wellpoint, CVUSD, LRRMC, Baxter, Verizon, Dole, The City of Thousand Oaks as well as ALL other PPO insurance plans. To read more about using your insurance benefits in our office you can click here to read some of the common questions that our patients ask us. We're proud to be part of the community in Thousand Oaks. Dentist services are a vital part of health and hygiene, and our expert team knows that your smile is as precious as you are. Dr. Hong and her skilled team look forward to your next, or first, visit to our office. Fill out a form or call us at (805) 480-9820 to schedule your appointment today! Call us today at (805) 480-9820 and take your first step toward a brighter smile! We use the latest in Dental Technology to provide the best possible service for our Valued Patients. During your exam you can watch your favorite television show, listen to music, or even resume your Netflix shows. Your comfort is our priority! Dr. Kari Ann Hong grew up in Thousand Oaks and graduated from Westlake High School in 1996, as a valedictorian. As a child she had many fond memories of playing in her father's office with plaster and attending the California dental associations annual conventions. While an undergraduate freshman at UCLA, she volunteered in a dental research laboratory and decided she wanted to apply to dental school. In 2003, Dr. Hong received her doctorate in dental surgery from the UCLA School of Dentistry. Dr. Kari Ann Hong considers herself a life long learner and is always looking for new opportunities to gain knowledge of new materials and techniques. For example, Dr. Hong has advanced training from a yearlong residency course in Cosmetic Dentistry from Esthetic Professionals in Tarzana, California. In addition, she has completed nearly 200 hours of training in TMJ and occlusal therapies from The Pankey Institute in Key Biscayne, Florida. She is a member of the American Dental Association, the California Dental Association, the Santa Barbara-Ventura County Dental Society, and the Spears Study Club. In 2011, Dr. Hong's father retired from doing clinical dentistry and Dr. Kari Ann Hong took over the management and patient care at Thousand Oaks Family Dentistry. We at Thousand Oaks Family Dentistry are committed to providing excellent care for our patients. On a personal note, Dr. Hong enjoys spending time with her husband and three young sons. She and her family enjoy an active lifestyle of water skiing, snow skiing, boating, hiking, and overall adventure seeking. Dr. Chrissy Tapp grew up in Pennsylvania, where she attended Allentown College of St. Francis de Sales and earned a B.S. in Chemistry. She moved to southern California for dental school and earned her doctorate in dentistry from the USC School of Dentistry in 2004. A year later she settled in the Conejo Valley and has worked with many of the finest dentists across Ventura County. Dr. Chrissy Tapp is a member of the American Dental Association, the California Dental Association, and the Santa Barbara-Ventura County Dental Society. She is also a member of the Spears Study Club, and has taken hundreds of hours of continuing education with an emphasis on providing the highest quality conservative dental treatment. In addition, she is dedicated to providing each patient with individualized care and service. Outside the office, Dr. Tapp enjoys spending time with her four year old son, Evan. They love being active outdoors with friends and family. 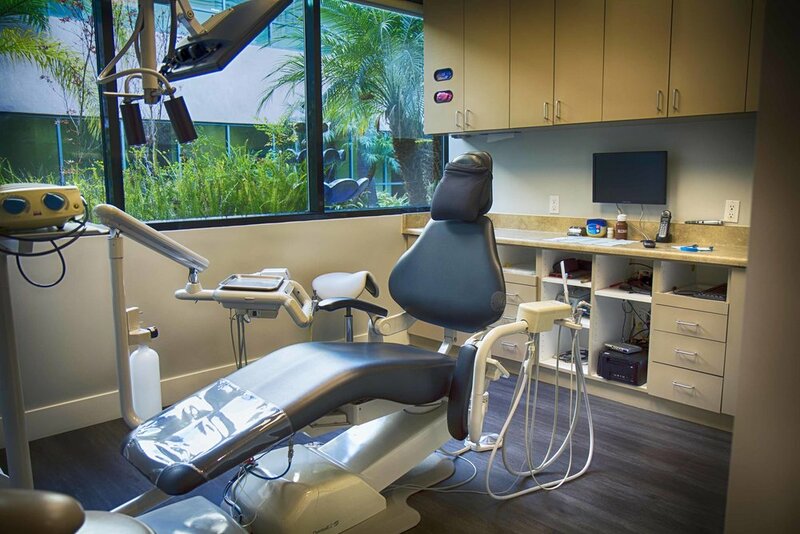 Dr. Jerry Hong has been practicing dentistry in the Conejo Valley since 1975. Dr. Hong graduated at the top of his class from the UCLA School of Dentistry in 1975. Since then he has been at the forefront of nearly every technological advancement in general dentistry. He retired from full time practice in 2011, but continues to supervise hygiene, use his expertise for comprehensive exams, and to treat patients suffering from sleep apnea. When not at the office, Dr. Hong can be found serving others through the food bank and shelter at the United Methodist Church of Thousand Oaks. He is also an avid cyclist, a skilled master woodworker, gardener, and grandpa extraordinaire. Our office is committed to making you feel at home. We offer a full array of dental services to help you maintain healthy teeth. Keeping our patients comfortable is very important to us. If you're interested in Thousand Oaks dental services, we are the team for you. Contact us by email at staff@thousandoaksfamilydentistry.com or call at (805) 480-9820 to set up an appointment -- we look forward to seeing you!